How Much Should Apple's Tablet Cost? Apple take heed, if you are actually going to launch that iSlate next week you better keep the price below $700, it needs long battery life, and don't expect consumers to bite if it requires a pay-for-data plan. Long Battery Life, a Must! 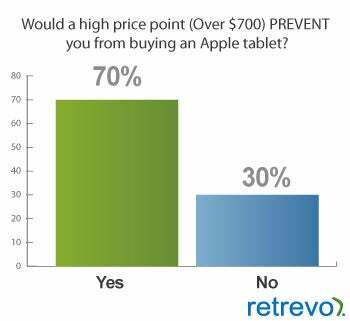 Seventy-five percent of people told Retrevo they want a long battery life (more than 6 hours), and 28 percent said if Apple wants them as a customer the tablet must have an e-book store with a big selection. 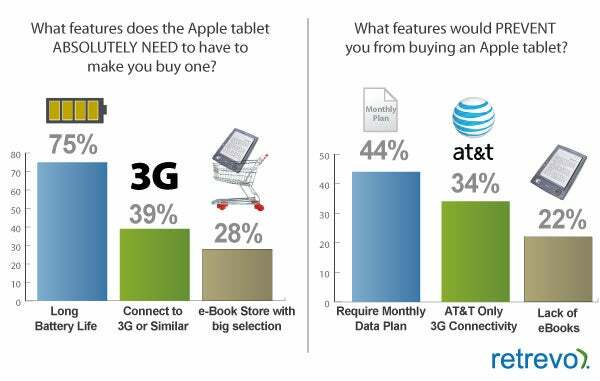 Deal-breakers included AT&T-only connectivity (34 percent said this would prevent them from buying an Apple tablet). As for the e-book store, it may be a reality. The Wall Street Journal reports that Apple has spoken with several publishing companies, including The New York Times and HarperCollins, and Conde Nast, about publishing content for the tablet. 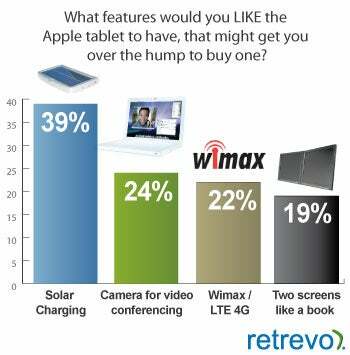 The Retrevo survey revealed the most sought-after feature is solar charging, with 39 percent expressing interest in the feature. Consumers are also looking for a forward-facing camera for video conferencing (24 percent requested this), 4G connectivity (22 percent), and two screens instead of one (19 percent). I'm still trying to figure out how a tablet can have two screens (maybe something like Microsoft Courier ?). iPhone owners were more likely to want an operating system that ran iPhone apps over Mac apps by a 3-to-2 margin. Seventeen percent of those surveyed said they'd like to see a tablet that can run iPhone apps, while 18 percent said they'd like to see a table that can run Mac OS apps. Sixty-five percent of consumers surveyed didn't care either way. The Wall Street Journal reports that the upcoming tablet will cost around $1000, which could be too pricey for consumers: 70 percent of the surveyed consumers said that a tablet priced over $700 would be too much. This may be due to the fact that roughly 50 percent of the respondents said they didn't think they needed a tablet computer, and at least 30 percent said they'd need more information before they decided one way or the other. Still, 30 percent of the respondents said they'd be willing to spend more than $700, which is not bad. The Retrevo survey was based on a study of more than 500 randomly selected Retrevo U.S.-based users distributed across gender, age, income, and location.